Secure content platforms that transform the way you share, manage and collaborate on your most valuable corporate information. Designed without compromise between security and ease-of-use, these platforms allow every employee to securely work across teams, with customers and with partners, on any device, anywhere. Adopting a secure content platform will help you keep sensitive documents out of email and away from insecure consumer services. Smarter.ECM for BlackBerry Workspaces …powered by Qlik allows you to monitor, measure and manage the platform. Qlik lets you create visualisations, dashboards, and apps that answer your company’s most important questions. With Qlik, individuals and enterprise can see the whole story that lives within your data. Enterprise Content Management describes a strategic framework and a technical architecture that supports all types of content and format throughout the content life cycle within a company. One primary goal of ECM is to eliminate ad hoc processes that can expose an organisation to regulatory compliance risks and other potential problems. Full-function ECM systems include features such as document and records management, content taxonomies, auditing capabilities, check-in/check-out and other workflow controls and security mechanisms. Smarter.ECM for BlackBerry Workspaces combines the features of these advanced platforms to offer the perfect analysis and governance framework for Workspaces within your enterprise. 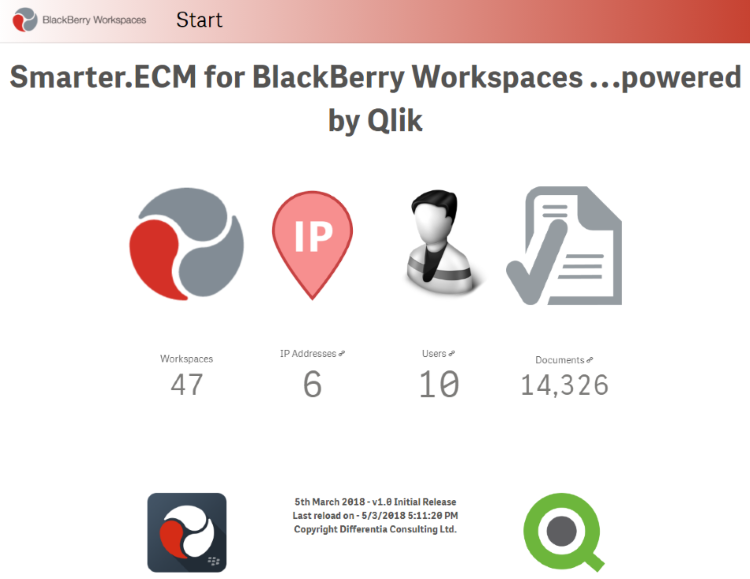 Utilising Qlik’s unique associative analytic platform to reveal patterns in your Workspaces usage data, Smarter.ECM for BlackBerry Workspaces gives unrivalled audit capabilities over your Workspaces installation. Analysing the metadata of your content allows smarter content management, for example revealing duplicate copies of documents, or highlighting where documents are missing in an expected process sequence. Smarter.ECM for BlackBerry Workspaces lets you integrate BlackBerry Workspaces usage and content data with your other business information for a comprehensive solution. Enterprise content management (ECM) provides organisations with a trusted platform to store unstructured content and deliver it in the most appropriate formats to enterprise. ECM allows enterprise to efficiently build content-rich business applications and easily share and integrate content. Fundamentally ECM will decrease costs, automate processes, reduce resource bottlenecks, share content effectively, minimise the number of lost documents, and better manage risk. This BlackBerry Workspaces Analytics tool Powered by Qlik Sense provides complete information on the performance of your Workspaces activities. It provides an audit trail and analytics to asset or document governance related activities. 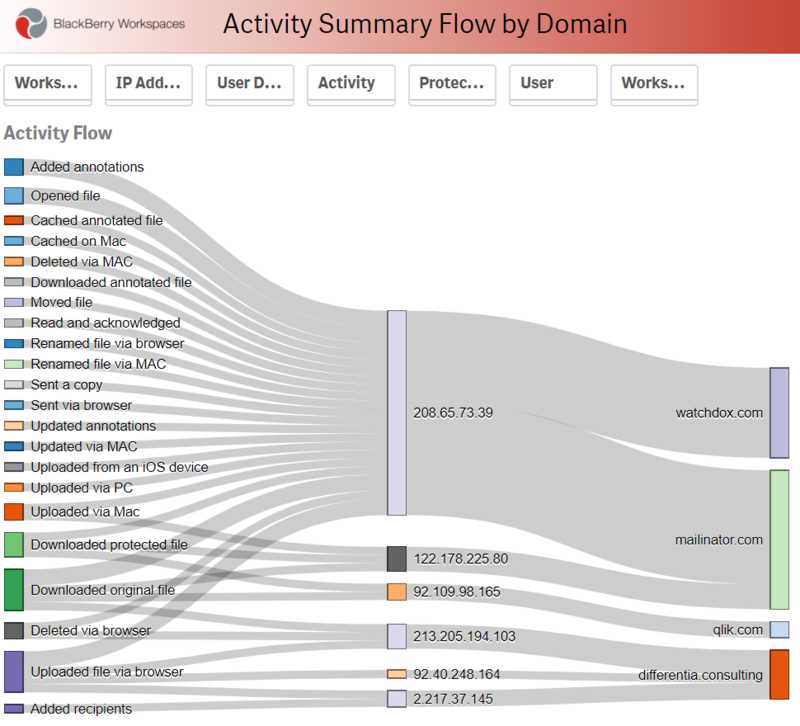 The application creates a single view of Workspaces activity, the way your enterprise documents are being accessed, by who where and when. To understand how Smarter.ECM for BlackBerry Workspaces …powered by the Qlik Analytics Platform can help your business get in touch today.